Supergirl Preview Discussion: Cheesy or empowering? So let’s talk about that Supergirl preview that came out a few days ago. Supergirl is one of my favourite heroes but to be completely honest, I did not love this preview. I get what they are going for, and the target market they’re trying to reach, it ain’t me. 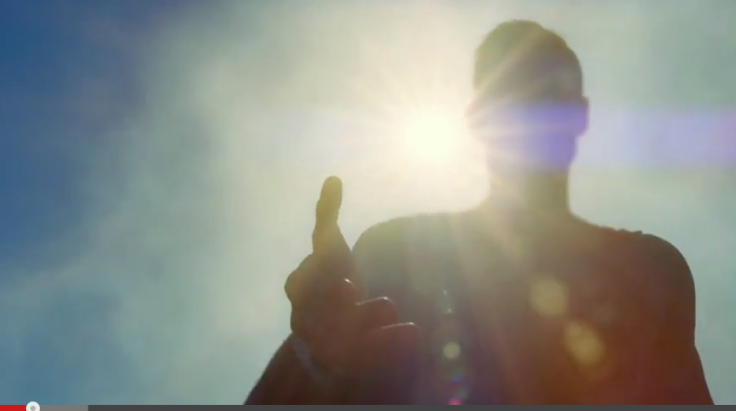 But let’s discuss the Supergirl preview! For me I enjoy the Supergirl who grew up on Krypton and then came to Earth. She wasn’t raised like Clark was, she didn’t have her version of the Kents. Because of this she didn’t have much attachment to humanity. At first, she didn’t understand her cousin’s love for humanity. However after a while she slowly started embracing her heroic side, and formed a connection to humanity. Although her heart will always belong to Kryptonians, they are her people. Because Supergirl didn’t grow up on Earth, she isn’t totally in tune with social cues. She can be a little forward, and generally just says what’s on her mind. When she’s fighting she might be a little more brutal than Superman, she’s incredibly headstrong as she isn’t as used to fighting on Earth as Superman is (check out the Justice League animated series for a great Supergirl). Which brings us to this Supergirl preview. Here we have a young girl who is sent to Earth, found by her cousin, and sent to live with a loving family. She grows up on Earth, and becomes part of humanity. She has a job and friends, and it’s all very happy. 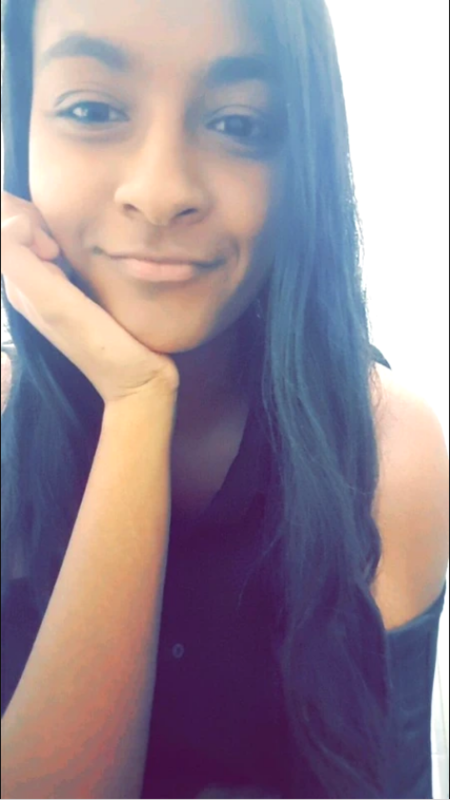 Personality wise she comes off as your classic cute/awkward nice chick. And you know what, that’s fine. It’s clear CBS are making a show that they want to appeal to as big as an audience as possible. This show will be great for younger females who can hardly find a Black Widow figure, and for families to watch on a Monday night. I don’t think this show is for me yet, but I guess I can’t make a complete judgment, not until I actually watch it. Now I’m not saying I want a dark and gritty Supergirl show, but this show just seems wayyy too peppy for me. I would have liked to see a Supergirl who starts off a little distant from humanity, who doesn’t really like us as much, and would much rather be with her fellow Kryptonians. But then as she starts living on Earth more, doing new things, meeting new people, she starts to form a connection with humanity, and then forms her Supergirl persona. This Supergirl might be a little too forward and headstrong sometimes, and might not start off as the nicest person to humans, but as time goes on she becomes more of the lovable Supergirl we see in the preview. With the trailer music, one-liners and slogans, the Supergirl preview came off as a little cheesy to me. But I know for a lot of people, they saw it as quite empowering, and are glad a female superhero is getting the treatment she deserves. But really you could have made an empowering Supergirl who isn’t your cliche cute/awkward chick who goes on to get a lot of confidence! I get it’s important to present a relateable hero, especially for younger girls, but then you start bordering over the line of cheesy. Superman obviously exists in this world, we see shots of his figure but nothing much else. I’m not sure if they’re actually allowed to full on show Superman or not, but this is Supergirl’s TV show, so no need for Big Blue to steal the spotlight. 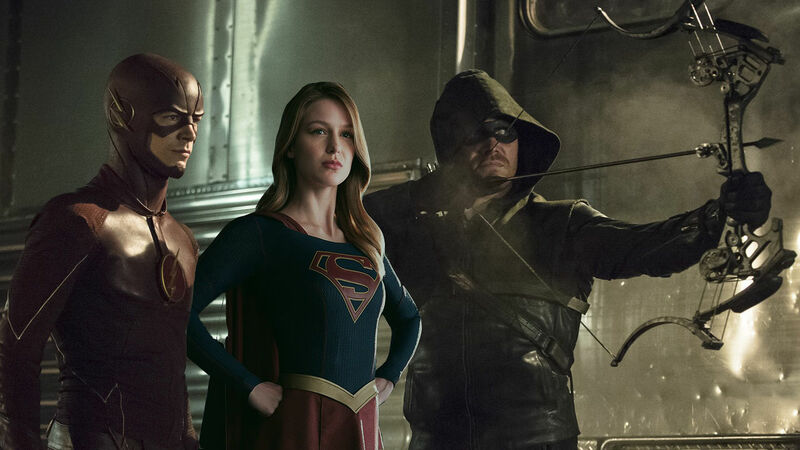 And because we have some of the Arrow/Flash producers working on Supergirl, the question everyone has been asking is, will Supergirl crossover to Arrow and The Flash? I would hope not because I don’t want the Arrow/Flash world, to exist in a world where Superman exists. The Arrow/Flash world are creating their own Justice League, and instead of Superman and Batman being the top bosses of the League, it’s Arrow and The Flash, which I like. Next up we see that one of Kara’s work friends is Winslow Schott, who we know as the villain, Toyman! We see little toys on his desk at work, foreshadowing his villainous future. I just hope he doesn’t become evil because the girl he likes doesn’t like him back. 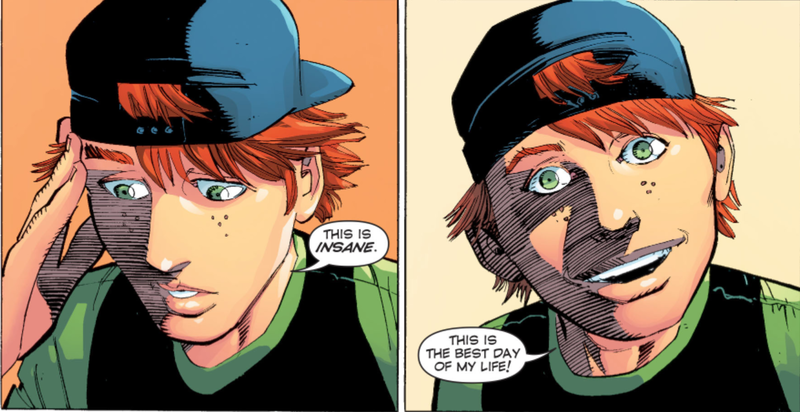 We also see Jimmy Olsen….well their version of Jimmy Olsen. Look I don’t care about race changing characters, as long as you get the core of the character I’m all good. I don’t see Jimmy (sorry James) Olsen in this preview. Jimmy is supposed to be a bit of a dork, he’s awkward, funny, and very fun loving. Instead we’ve got tall, dark and handsome Jimmy Olsen, which is weird. It also looks like both Olsen and Schott will know about Kara. Schott is the tech guy, so it makes sense to have him help her out. And Olsen seems to be Superman’s messenger, which begs the question, where is Superman that he’s so busy he can’t even talk to his own cousin??? Cat Grant, who’s normally Clark’s workmate at the Daily Planet, is now the big boss. Of course they’ve gone for the cartoonish sassy female boss. Supergirl working with her sister’s organisation could be interesting, it looks like we’ll be seeing some other aliens on the show. As for the costume, it looks pretty great. I liked that little Man of Steel nod, “It’s not a S”. Visually the action looks good, it’s hard translating Supergirl’s powers onto the small screen, but they’ve seemed to have done it pretty well. Compared to The CW, CBS has a much bigger budget, so they should be able to show us some great action. 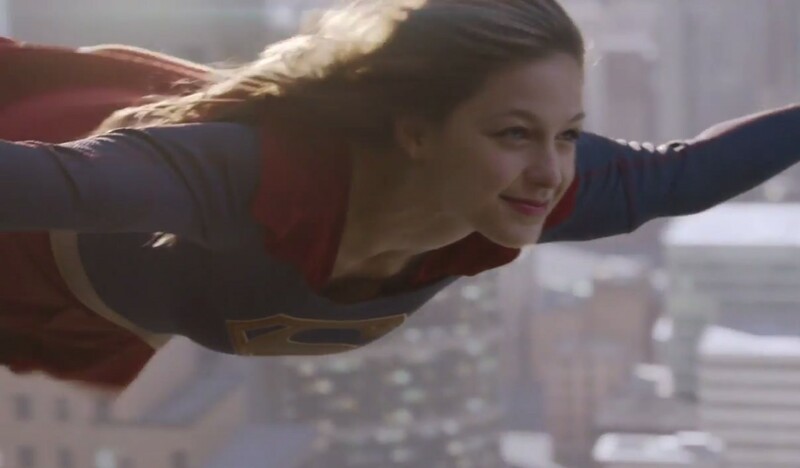 Overall I can’t say I’m excited for this Supergirl show, but I’m sure that the show will have wide appeal with families and younger (and older) girls, which is great! One of the problems with the failed Wonder Woman Pilot was that they tried too hard to make Diana a relatable female character (they had her sitting on the couch eating ice-cream watching The Notebook yupp..) they failed to really represent her character. So I just hope we’re not getting Felicity the superhero, and we’re actually going to get Supergirl in this show, maybe making her character a little more fierce will get me interested! The Flash Season Finale Discussion: Did we just create a multiverse??? When I first heard about the show I was all: I am not sure if they can do the action needed on a TV budget. Then I saw the preview with her recuing the plane and I was: “Yeah, that looks pretty good.” But the more I saw about it – the cheesy music, the way she is represented – the more taken aback I was. This looks like a Superhero chick flick. And I don’t mean the “good” ones like Notting Hill and co which I will defend to my dying breath. I mean the “bad” ones, in which some lazy writer put something together with the sole purpose to appeal to the kind of woman who love to read cheesy romance novels. The tipping point was the little speech about using the word “girl” being empowering. Really? I don’t thing that there are many women who would buy this BS. At least I hope not. I understand your apprehension in viewing the trailer, but if i’m looking at this from a producers point of view, this might be the best way to go. It is Supergirl were talking about here. There’s some inherent cheesiness that you have to expect. One thing is for sure, this looks better than both Lois and Clark and Smallville combined. I was’nt a fan of either of those shows. I think a big part of what will shape this version of kara is the age in which she left krypton. She departed the planet at 12 years old instead of say 16 or 17. That makes a difference to me because the sooner she arrives on earth the more humanity and connection to earth she has, and that’s obviously what the producers want. They want the character to be as relateable as possible, personally i think it may turn out to be a wise choice. Having her arrive on earth as a kid in her late teens would make her even more alien which could perhaps set up a more interesting character, but a less relateable one. You are absolutely correct when you say they want this to be a family friendly type show that appeals to mainly young girls. However, i will say that they could potenially bring in some male viewers if the alien invader comicbook story lines are done well. All in all, we will just have to wait and see. Also i agree with you that there’s no way this show can connect with arrow and flash simply because Superman exist in this universe. I read some comment online such as the usual “this is terrible / you are ruining my childhood / I have to kill myself now in protest” variety, so I watched the trailer, and I thought the show looked fun. I am not the target audience for this show at all, but it is the first of the new crop of superhero shows that I am actually interested in watching. I don’t care for Smallville or Arrow at all. I have yet to watch Flash or Daredevil which seem to be much closer in tone to the source material from what people are saying. Supergirl I would prefer to see as a big screen modern film than a TV show, I’d like to see that film as much as a Wonder Woman film, being that she is one of the few old time DC female heroines who is still around (although who the character is keeps changing pretty frequently) that is both iconic, recognisable to young and old, and a pretty cool character in my book. So yeah, I’m optimistic about his show, and I’m glad it got made, because the character is more deserving than many others of being expressed in new media. The trailer doesn’t make the show look amazing and maybe it’s a bit cheesy at times, but Supergirl clearly has potential. I’m still looking forward to it. Oh yeah it definitely has potential, I’m hoping for the best, that’s for sure! I mean, this is an up-fronts trailer– gotta take it with a bit of salt. They are doing a trailer for an entire show based off only the footage from a single pilot episode. We all know that what makes TV shows click and work is the chemistry of the cast, which won’t be evident until several episodes in, so I’d rather not make any judgement on the show as a whole based off a 5 minute up-fronts trailer. As far as Kara’s personality- they really are kind of working with a blank slate here. Silver Age Kara barely had a personality since it was, you know, the Silver Age. Then Kara was dead for a long time. Then when she came back in the 2000s she was basically a puppy dog in the pre-52 reintroduction– almost the same enthusiasm about everything that Impulse had. Then in New 52 she turned into a rage monster/ Red Lantern– you know there’s zero percent chance they go there for the TV show. So all in all having her start out as a mixture of Caitlin/Felicity personality wise is a choice that I’m fine with– we love the way both those characters are written on their respective shows, so I am willing to give the DC TV-Verse crew the benefit of the doubt.